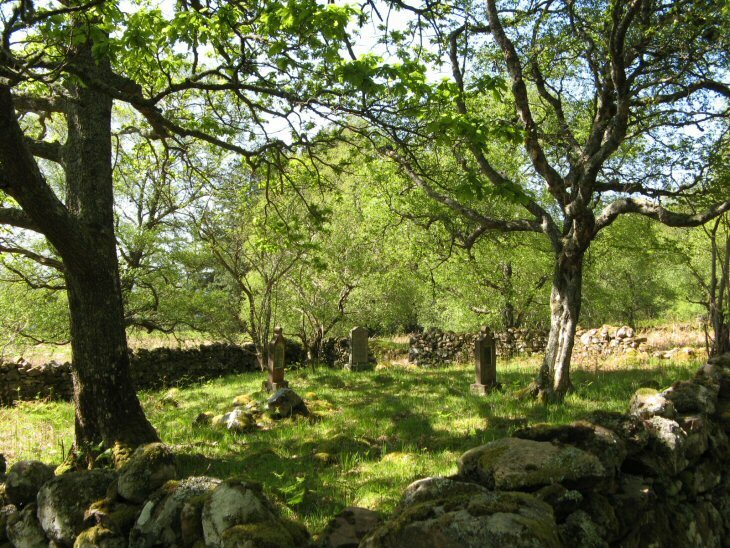 This is an unofficial 'private' burial ground, beautifully sited above a burn, just behind Lower Diabaig, Loch Torridon. Diabaig is just within Applecross Parish. However, the area historically looked to Gairloch, and lay within the bounds of the lands of the Mackenzies of Gairloch. The story is that most burials were conducted in Gairloch, the bodies being conveyed by sea. When storms prevented this, and despite offers of help to carry the coffin to Gairoch, a crofter determined to bury his relative on his own land. There are four headstones. They appear to be of related persons (McKenzies). Added by Kevin Mcdonald on 29 May 2015. Im also trying to trace Mackenzies from the area my 7th great grandfather was born there. His name was Alexander and his wife was Margaret Galbreath. Any info would help. Added by Debby Worden on 09 June 2015.